Our beers are german-inspired and uniquely sessionable – designed to showcase deep flavors in an approachable package. Using unfiltered Snoqualmie Pass mountain water, imported German malts and Yakima Valley hops we craft beers that are distinctly Dru Bru. “One-and-Done” batches of IPA with a focus on exploring exciting new ingredients and brewing techniques. Each batch will be released and sold-out before the next batch hits the streets. Deep amber-colored beer with layered malt flavors of toast, chocolate, and dark caramel. A touch of German-grown hops provide herbal and spicy notes to create this easy-drinking dark lager inspired by a Munich-style Dunkel. 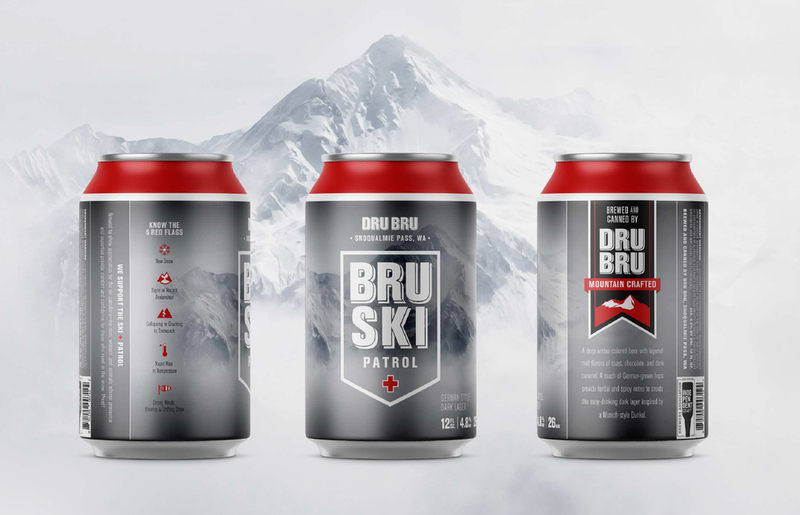 Brewed to show appreciation for the ski patrollers—the men, women, and animals whose presence and expertise provide comfort and confidence for those who revel in the snow. We have partnered with Seattle based Serious Pie to celebrate our mutual love and appreciation for pizza and beer. 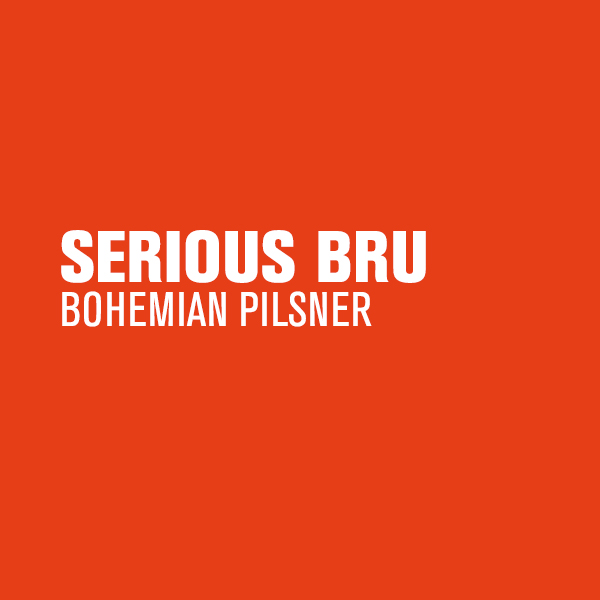 Modeled after an old world Bohemian Pilsner, Serious Bru is crafted with unfiltered Snoqualmie Pass mountain water, Bohemian Pilsner malts and Czech Saaz hops to put forth a complex maltiness with a soft bitterness. Golden colored German style ale with a light-medium body. German grown malts provide a bready aroma and flavor that's balanced with a subtle sweetness character - adding complexity as the beer finishes. Light copper colored ale that showcases an aromatic blast of citrus and tropical fruit flavors yielded from Mosaic and Citra hops. Brewed with a modest malt backbone with the intent of showcasing hop flavor without the high alcohol that typically accompanies IPAs. Copper colored ale erupting with citrus, tropical, and pine hop character. Ekuanot, Simcoe, and Amarillo Hops present over a pilsner and toasted malt base to showcase the essence of Northwest Hop character. An unfiltered, straw colored, German style wheat ale with a light-medium body. Bavarian "Weissbier" yeast creates notes of banana and clove which couples with German grown wheat and barley malts for a sweet and dry beer with a slightly tart finish. Red ale that's teeming with deep malt character. This German-style beer boasts a nutty, bready and caramel malt backbone blended with a spicy/resinous bouquet of hops to produce a surprisingly complex and balanced session beer. A German inspired light-bodied black ale dominated by roasty, burnt caramel and toffee notes. Northwest hops add a non-traditional citrus and resin character that results in a rich, yet surprisingly light-bodied and smooth dark beer. Small batch beers, only available in the Dru Bru Tap Room. What's a Windy Shot? It's an explosive blast, erupting through a coal mine’s air. This IPA is brewed in honor of Upper Kittitas County, where nearly 200 years ago coal mining pioneers embraced the area for its abundant beauty and bounty.